Hello :) and thank you so much for joining in the Funky Hand and Tiddly Inks Funky Inks blog hop....we have a veritable feast of inspiration using Anice's lovely papers and Christy's digis! I have used the “You’ve Retired” palette from the Wishes andKisses CD-ROM from Funky Hand and the gorgeous “Always the Flower Girl” image from Tiddly Inks. I have paper pieced the image by printing her onto the Funky Hand papers, then cutting her out and layering with foam pads. The image and the papers were a match made in heaven and I felt that the card didn’t need any further embellishment other than the simple sentiment. If you are just joining us. Just open a new window for each link (click CNTRL and the link to do this) and you can keep the main list up and navigate easily through the links. So join in the hop as both Anice and Christy are offering a gorgeous prize from each of their stores. Too good to resist surely?! Also, you will be able to see that the only limit is your own imagination. And if you feel equally inspired to have a go, please share your gorgeous creations with us on the Funky Hand Facebook page. I love this card. Paper piecing the fab image is a wonderful idea and look great. I think you are right you didn't need loads of other things going on, on the card you have made it perfectly. Wow this is amazing! Loving the paper pieced hair and fish tail flags! Honestly - if I can do it, then everyone else will be fine ;) She's a lovely image to use beacuse she's not too fiddly! You must have the patience of a saint!! I'd have cut through a body part!! Great colours too! What a great paper pieced creation! I love how you married the image with the paper. Her hair...great texture! She is so cute! Love the paper piecing! Would never have thought of doing hair like that...love it! This is REALLY cute!!! I love your piecing.. wow!!! Just amazing!! And you are a fussy cutter.. I'm a huge fussy cutter LOL Absolutely love it!! I just love this Sam! The gorgeous paper piecing and banners are such a great idea! The coloring of the hair is graet! a love the banners! 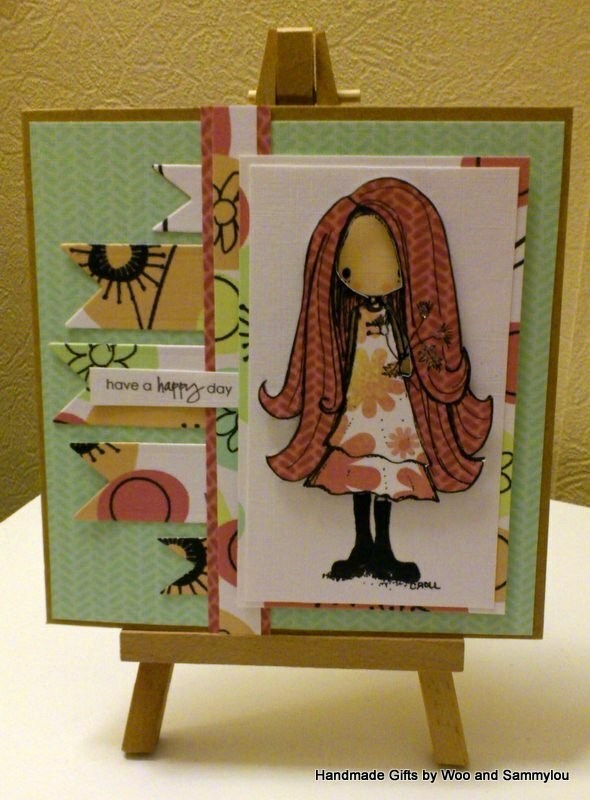 Great card...your coloring & papers are great together! Great card! Love all the paper piecing and the papers are perfect! Lovely card Sam, I love paper piecing and yours is great. Oh Sam, this is fantastic. This is one of my favorite TI images, and you paired her up so well with the fantastic Funky Hand papers! Great card. I really like the paperpieced hair. I have never seen paper pieced hair before, and I LOVE it!! What a wonderful idea Sam!! Wonderful work!